Canon Digital Learning Center put out an article by by Gordon Lewis on how to maximize the use of Speedlites in flash photography. In addition, they have published another article by Liza Gershman on how to conduct successful wedding photography. For those who aspire to be a full time portrait or wedding photographer or those who earn extra income by being a part time photographer, these articles make interesting reading. Click here to see more tips from Liza on getting that perfect wedding shots. You’re probably all-too familiar with the typical photo you get when you use your camera’s built-in flash. At best, it looks a lot like the one to the left. Sure, it’s sharp, correctly exposed and in focus, but if you’re looking for subtlety, variety, and sophistication, you’re going to have to up your game. One of the best and easiest ways to do it is to invest in a simple, affordable, and versatile device known as a Canon EOS Speedlite. 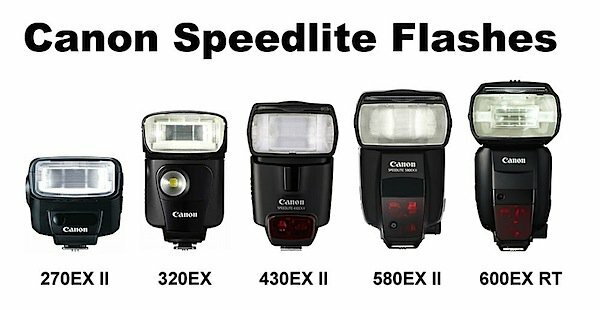 A Speedlite is what Canon calls its electronic flash units that fit into the accessory shoe on top of your EOS system camera. Even the smallest, lowest cost Speedlite will make a significant improvement in the quality of your photos, even if you only use it for direct on-camera flash. One reason is that a Speedlite has a much larger, more powerful flashtube than your pop-up flash. This allows a Speedlite to spread light over a wider area and reach out to a greater distance, all without your having to crank up your camera’s ISO setting or open the lens up to its maximum aperture. This is particularly useful when you’re shooting with wide angle, telephoto, or zoom lenses. A Speedlite mounted to an EOS camera can automatically narrow its angle of coverage to provide a more concentrated beam for telephoto shots, or widen its angle of coverage for more evenly lit wide-angle shots. Another benefit of using a Speedlite is that it greatly reduces what’s known as “red-eye.” Red-eye is caused by the light from your flash going straight into your subject’s eyes, reflecting off of the retina, and reflecting back into the lens. This is most likely to happen when your subject is looking directly into the lens. The closer your flash is to the lens axis, the more likely it will cause red-eye. This is much less of a problem with a Speedlite, which raises the flashtube at least two inches or more above the lens. The increased height of the Speedlite’s reflector also reduces the problem of long lenses (or lenses with lens hoods) intruding into the lower edge of the light coverage and casting a shadow. Finally, keep in mind that your pop-up flash draws power from the same battery you use for your camera. Heavy use of your pop-up flash can quickly deplete your camera battery. A Speedlite uses its own separate AA batteries, so even if its batteries die, your camera will still keep shooting. ISO settings for fill flash in bright daylight: You should ideally set your camera to a low (100-200) ISO. If your camera is set to Auto ISO, the ISO will default to 400 when you’re using flash. This will normally cause the shutter speed to be too high for normal flash sync. Activate High Speed Sync on your Speedlite: Your camera normally can shoot flash pictures at shutter speeds up to anywhere from 1/180th to 1/250th of a second, depending on camera model. In bright sunlight however, even 1/250 may be too slow to prevent an over-exposed background. If you activate High Speed Sync on your Speedlite, the camera will be able to set any shutter speed it needs to and still work with flash. Just bear in mind that High Speed Sync reduces flash output, so you’ll need to be fairly close to your subject any time you’re using a shutter speed faster than your camera’s normal maximum flash sync speed. Camera exposure mode: You can use any automatic exposure mode, even the full-auto “green zone,” and achieve balanced fill-flash with a Canon EX-series Speedlite. The camera will automatically try to balance the ambient light and light from your flash. If you prefer to use Tv or Av modes, if the camera cannot properly expose the ambient light, you’ll see a blinking aperture number (in Tv mode) or shutter speed indication (in Av) in your viewfinder — just set a different speed or aperture, depending on the mode you’re in, until it stops blinking. If flash-fill appears to have no effect at all, you may need to move closer to your subject. To be specific, you need to reduce the flash-to-subject distance. Zooming-in will have no effect. Flash-fill can be tricky in mixed lighting. The color temperature of your Speedlite may be noticeably cooler than the ambient light. Canon and other companies offer CTO (color tone orange) filters you can place over the Speedlite reflector to provide a closer match to indoor tungsten lighting. And yes, your Speedlite will automatically adjust to provide the correct exposure. Direct flash looks the way it does because when the flash is pointed in exactly the same direction as the lens, the light is always the same: head-on. What’s more, the light travels toward your subject in a focused beam, which casts dark shadows onto anything or anyone immediately behind. The relatively small size of the flash reflector also contributes to this spotlight effect. Contrast this with the quality of light you get when, instead of pointing the flash directly at your subject, you “bounce” it off a nearby reflective surface, such as a wall or ceiling. The effective light source becomes much larger relative to your subject (similar in concept to the light on an overcast day vs. bright sunlight) and, because the light scatters in multiple directions, more diffuse. Highlights become broader and more even. Transitions from light to shadow are softer, less hard-edged. Canon’s mid-to-upper range Speedlites have a bounce/swivel head that makes this a simple matter of pointing the flash reflector away from your subject. Better yet, your EOS camera’s autoexposure program will communicate with your Speedlite to help ensure a correctly exposed, well-balanced image. Make sure you aim the flash head far enough upward and away from your subject so that no light strikes the subject directly. Indirect flash is inherently less efficient than direct flash. If your indirect flash images are consistently underexposed (too dark), you may need to increase the ISO, use a wider aperture, or both. The lighter and more color-neutral the reflecting surface, the better. Dark walls and ceilings soak up light, while bright colors can cause noticeable color casts. If no suitable wall or ceiling is nearby, you can substitute a large sheet of white poster board or foam core (or a white bed sheet, for that matter). Experiment with the distance and angle of light relative to your subject. A few feet closer to the reflecting surface and a slight shift in lighting direction can make the difference between an okay shot and a great one. If pointing your Speedlite in a direction other than straight-ahead sounds fun, imagine how much more freedom you gain when you remove the Speedlite from your camera’s hot shoe entirely: not only do you gain more control over lighting direction, you can move the flash closer or further away than the camera itself. At the very least, off-camera flash allows you to mount your Speedlite onto a flash bracket rather than your camera’s hot shoe. A bracket moves the flash higher over the lens axis, which in turn causes any shadows from direct flash to fall behind and below your subject. Depending on design, a bracket can also position the reflector so that it matches the horizontal or vertical orientation of your camera for more even coverage. If you’re only taking a few shots, you may want to dispense with a flash bracket entirely. This allows you to remove the weight of the flash and bracket from your camera, which in turn makes your camera a lot lighter (no pun intended) and easier to handle. There are two ways to achieve off-camera flash while maintaining full auto-flash exposure: wired and wireless. With the wired method you attach an E-TTL compatible cable, such as the Canon OC-E3 Off-Camera Shoe Cord, between the Speedlite and your EOS D-SLR. The main benefit to a cord is that it provides a direct connection to your camera, with no setup necessary. You also don’t have to worry about getting any interference from other flash units, as you might with the wireless approach. The only downside is that you can’t move your flash any further away from the camera than the length of the cord. This is fine when you’re using the fore-mentioned flash bracket or taking a few quick close-up shots, less so when you need to place the Speedlite more than an arm’s length away from the camera. Wireless off-camera flash frees you from cords and cables. If you have a recent model EOS system D-SLR, it may even free you from having to buy a separate wireless flash trigger or “master” flash unit. You can set up your pop-up flash as the master and the off-camera Speedlite as the slave. If your camera has this feature, it’s activated within the Flash Control — Built-in flash settings menu of your camera. Activate that, then follow the instructions in your Speedlite owner’s manual to set your off-camera flash up as a slave unit. The built-in flash will then use pre-exposure flash bursts to communicate with the slave, trigger it, and adjust exposure. In the same camera menu, you can define whether the built-in flash also fires in the actual picture, or simply acts as a transmitter. Major reminder: When you set your built-in flash to its wireless flash mode, remember to re-set it back to normal operation when you’re finished. The built-in flash’s output is greatly reduced when set for wireless operation, and will have minimal, if any, effect on exposure. If your Canon EOS D-SLR lacks a built-in flash with wireless capability, fret not: you have other options. You can either attach a compatible Speedlite that features “master” capability (such as Speedlite 600EX-RT) to your camera’s accessory shoe, or you can attach an optional Speedlite Transmitter ST-E2. Either accessory can trigger a remote Speedlite, however the ST-E2 is a transmitter/trigger only and can’t be used as a flash. With your flash off-camera, you have the freedom to place it on a light stand, a tripod, a nearby branch, or any other secure and stable support you have available. You can also use simple light modifiers such as umbrellas, reflectors, and grid spots. The only requirement is that your camera and flash are in direct line-of-sight of each other, with the front of your Speedlite pointed toward the camera and within range of the built-in flash or transmitting device. The Speedlite reflector itself, however, can be pointed in a different direction. If you’re using on-camera flash, keep in mind that most are not really designed to be used closer than about 2 or 3 feet (0.7–1m) from the subject. It’s easy to get uneven lighting or even cast shadows from the lens onto your subjects if you do. With more advanced Speedlites, zooming the flash head to a wide-angle setting (even if you’re not using a wide-angle lens) can spread the flash illumination and help even it out. E-TTL automatic flash exposure still works well, at least as a starting point, for close-up flash pictures. However, for good, sharp close-ups with flash, it’s often best to avoid combining flash with ambient light, and simply let the flash be the dominant light source. To reduce the number of variables to keep track of, I recommend shooting with your camera (not the flash unit!) in manual mode (M) and starting with a fixed ISO of 100, a smallish aperture (f/11 or so), and at your camera’s fastest normal flash shutter speed (again, usually around 1/200th of a second, depending on the camera model). You can then use flash exposure compensation to increase or decrease the E-TTL flash exposure (i.e. brightness) to your preference. Where and how you position the flash is up to you. That said, the less distance there is between the front of your lens and your subject, the more difficult it will be to light the subject from the front without casting shadows from the lens. Wireless flash, with a Speedlite off-camera, works really well here, even if you’re just holding a Speedlite in one hand and your camera in the other. If you want to lighten the background, you can do so by using a slower shutter speed. This will allow more ambient light (assuming there is any, of course) to add to the total exposure. This is a favorite technique among wedding photographers, who use it to prevent backgrounds from becoming too dark when they use flash to light subjects in the foreground. The trick is to avoid too long a shutter speed, which can lead to blur from subject and camera motion. Aperture-preferred (Av on a Canon EOS camera’s Mode Dial) is the easiest way to go if you’d prefer to let the camera choose the shutter speed. Manual mode (M on the Mode Dial) will allow you the most direct control over aperture and shutter speed without sacrificing flash autoexposure. Either way, if you notice blur caused by subject motion and want to use a faster shutter speed without causing under-exposure, increase the ISO. Each time you double the ISO — for example, from ISO 400 to 800 — the camera will automatically make the shutter speed one stop faster. The reverse is also true: if you want to darken the background while in Av mode, all you need to do is set the camera’s Exposure Compensation to a “minus” setting. Just remember that this will only darken the ambient background exposure, not the foreground flash exposure. Use Flash Exposure Compensation (FEC) to independently adjust the flash exposure. Feeling edgy and experimental? Try combining flash with a slow shutter speed (1/8 second or slower). The result will be an image where areas lit by flash will be clear and sharp, while areas lit by ambient light will be streaked and blurry. Keep in mind the results are unpredictable and will depend on variables such as the amount of ambient light, background distance and reflectivity, shutter speed, ISO, and so on. They will also have a coolness factor totally unlike anything you would see without using flash. If you’re feeling a little intimidated about the prospect of using a light source that’s difficult to preview (as compared to continuous light), keep in mind that one of the benefits of using a D-SLR is that you can experiment with exposures and modes as much as you want and receive immediate visual feedback, all at little-to-no extra cost. The more you practice and experiment beforehand, the more confident you’ll be when you’re shooting in the moment. Just remember to take note of which settings are easiest and work best for you, so that if you use the same settings under similar circumstances, you can expect similar results. While experimenting, also be careful to keep track of your variables. The more fixed manual settings you have, while still using autoflash, the better; that way, if you want to see how changing the shutter speed affects exposure, you can be sure you’re seeing only the effects of shutter speed, and not shutter speed plus Auto ISO or flash exposure compensation. Your reward will be the confidence that, in bright light or dim, you’ve got the power and the skill it takes to chase away darkness and brighten any scene.